I like Gordon Ramsay. In fact, our whole family likes him! We’ve been watching him on TV long before he ever came stateside. What is it we like about him other than that he makes fabulous food? I am not sure. He’s loud and brash! Well, to be precise, he’s loud and brash with people who call themselves “Chefs” who try to sell their gruel to the unsuspecting public. In his TV Series Kitchen Nightmares, Chef Ramsay, on behalf of all people who have ever had a bad meal in a restaurant, yells at the Chef and yells again until they get it right! While the yelling might not be so pleasant, Chef redeems himself by being the Mother Theresa of the kitchen and by the time he leaves he has not only made them a better Chef but usually a better person too! A British pal of mine turned me on to the BBC version of Kitchen Nightmares years ago. One of the things I liked most about the British version of Kitchen Nightmares was Chef Ramsay performed more demos on how to prepare the dishes than he does on the U.S version. I have followed Ramsay on Twitter forever, or at least 3 years. In the beginning he used to tweet a lot of recipes, but not so much any more. 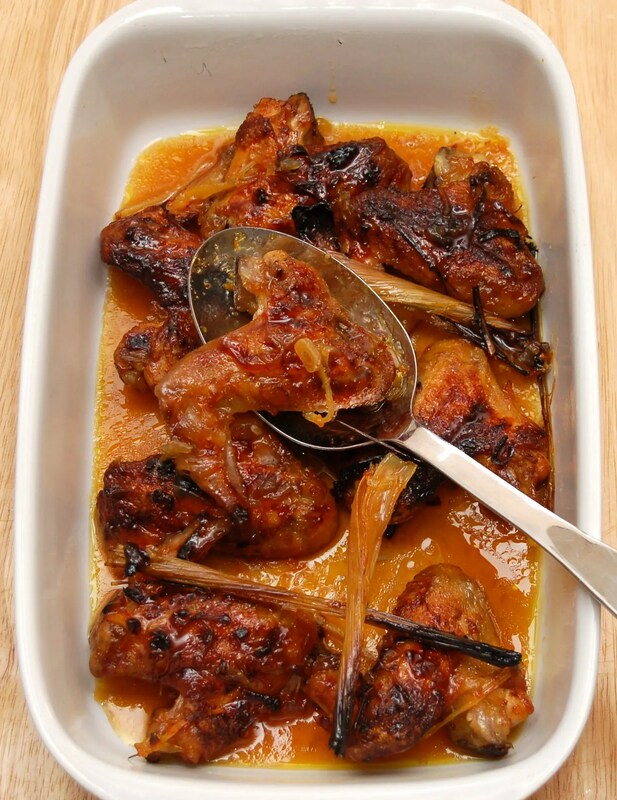 Once he tweeted a recipe for Orange and Ginger Caramelized Chicken Wings from one of his cookbooks [affiliate link] and I was instantly curious! Let’s start with the ingredients. 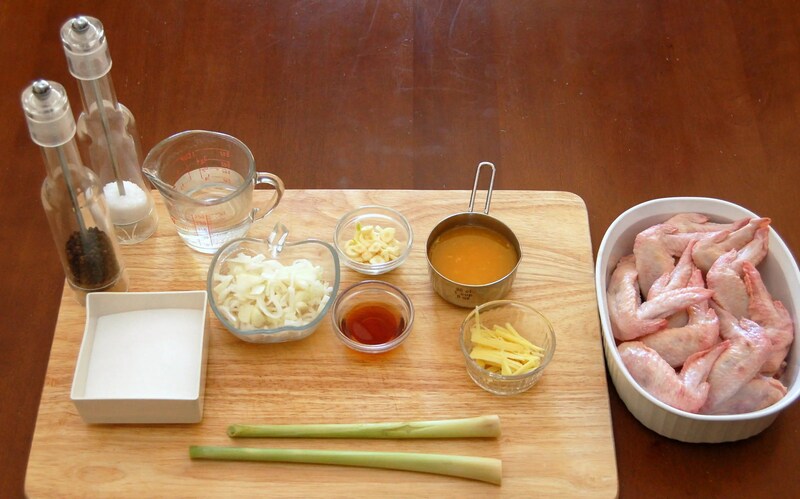 The sauce is made up of shallots, garlic, lemongrass, ginger, orange juice and zest, sugar, water and fish sauce. I had no trouble finding all of these ingredients at my local grocery store. I will recommend that if you live near an Asian Market you may find items like lemongrass and ginger are fresher and usually much less expensive. In a regular supermarket you will usually find the fish sauce in the isle that has the soy sauce. 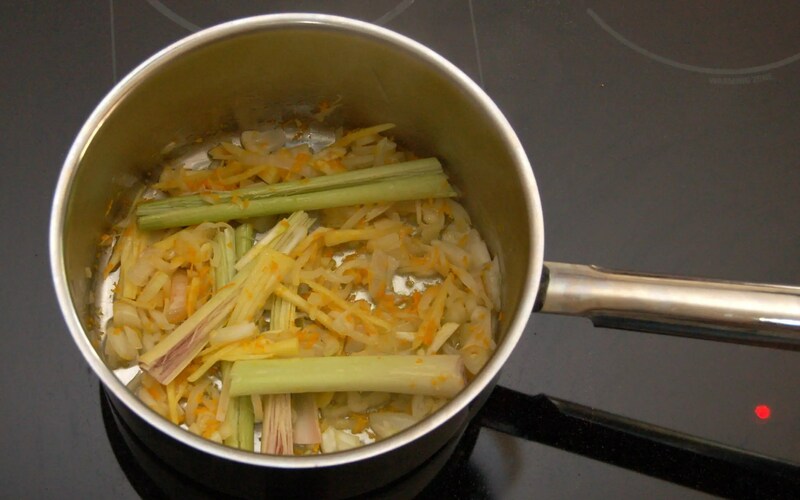 Next, cook the shallots, ginger, garlic, lemongrass and orange zest in a bit of oil before adding the liquid ingredients. This really helps in releasing the flavor into the sauce, so don’t miss that step. 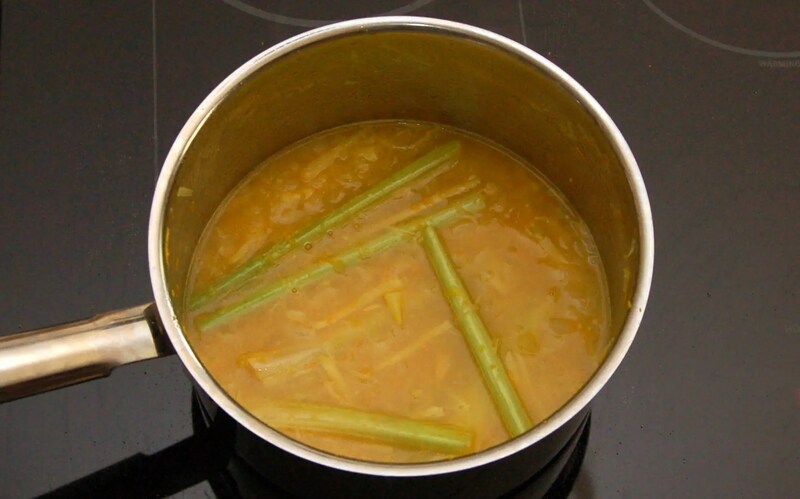 Ramsay also says to “bash” the lemon grass first, again to help release it’s flavor. Season the chicken with a bit of salt and pepper and sear in a bit of oil. 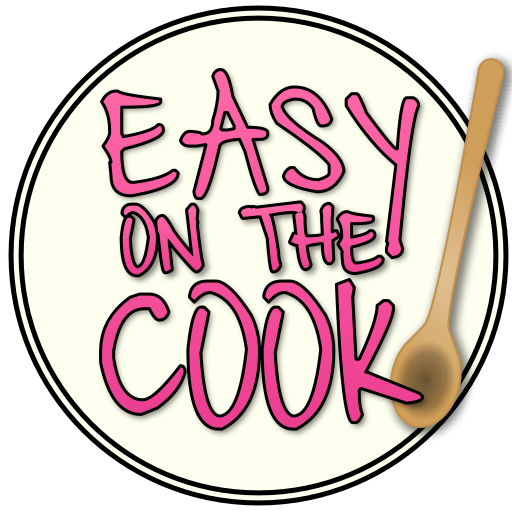 Just remember – to get a good sear, make sure the pan is hot enough. I always just touch a corner of the meat down in the pan, and when I hear a sizzle just as the meat touches, it’s ready to go. Just remember, don’t crowd the chicken in the pan or you won’t get a nice sear. Once you are done searing the chicken, you put it in a pan, cover it with the sauce and put it in the oven for 45 minutes, basting once half way through. Simple as pie… or even simpler! Preheat oven to 350 degrees. Heat pan, add oil and cook the shallots, garlic, lemongrass, ginger and orange zest. Cook for about 4 minutes until veggies starting to soften. Note - the lemongrass won't really get soft but you will start to smell it's wonderful aroma! Then add the sugar, water, oj and fish sauce and stir. Cook for about 5 minutes, or until the mixture has thickened up to the texture of syrup. Remove from heat. Next heat oil in a large frying pan. 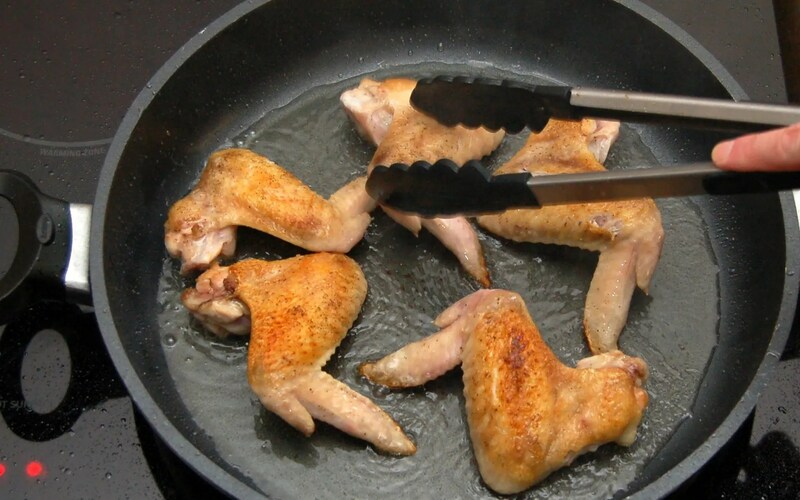 Season the chicken with salt and pepper than fry in batches until golden brown. Remember, don't crowd the pan or you won't get a nice sear. Next put the chicken in a baking pan and cover with the sauce. Bake for about 45 minutes. Be sure to baste the chicken with the sauce a couple of times during the cooking process. I also like to turn the chicken over during the cooking process. Before serving season the chicken with salt and pepper. Barely adapted. See the original recipe Gordon Tweeted here.